We are a parish of the Orthodox Church, under the Greek Orthodox Patriarchate of Alexandria, which traces its history back to AD 65, when St Mark the Evangelist brought the gospel of Jesus Christ to Africa, and planted the Church in Alexandria, Egypt. You have just found our cyberspace entrance, but we hope that if you are in Gauteng you will find our other entrances as well. Our services are mostly in English, though we occasionally use Greek, Slavonic, Romanian, Afrikaans and other languages as well. Those who attend the services are South Africans of various ethnic backgrounds (Afrikaans, English, Sotho, Zulu etc), and also of Greek, Russian, Bulgarian, Romanian, Serbian, Syrian, Lebanese and Ethiopian origin. All are welcome! On other festivals the times of services will be announced. Please contact the parish priest for more details. On the eves of great feasts the Vigil (Vespers, Litiya, Orthros) is served. The church is at 156 Fulham Road, Brixton, Johannesburg, about a block and a half west of the Brixton broadcasting tower, on the hill above the SABC offices in Auckland Park. In 1987 a group of Orthodox Christians in South Africa formed the Society of St Nicholas of Japan to promote mission and evangelism among Orthodox Christians, and to make Orthodox Christianity better known to non-Orthodox people. The society invited Fr Chrysostom Frank, a priest who had served in South Africa before, to return as its chaplain, and formed a small worshipping community that used English in the Divine Liturgy. A couple of years later the community was strong enough to become a parish, independent of the society, and, after three years of worshipping in borrowed halls and chapels, bought an old Protestant church building in Brixton, Johannesburg, and converted it for Orthodox use. The ikons on the ikonostasis were painted by a parishioner, Cathy MacDonald, who also painted many of the ikons on the church walls. Other parishioners have also painted some of the ikons. The music in the services is mainly Slavonic, though with some hymns sung to Byzantine and other melodies. Use the Corkboard for events, news, announcements and comments. 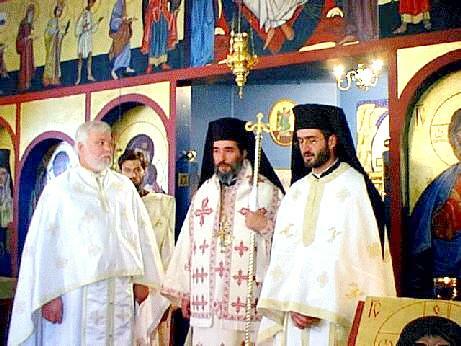 Other Orthodox links - An alphabetical list of links to other sites with information about Orthodox Christianity. Christian Network Links for Africa - links to Websites dealing with Christianity in Africa - both Orthodox and non-Orthodox. Join one (or both, if you live in Gauteng) to make contact with Orthodox Christians in southern Africa. Share news, coming events, questions, problems etc.